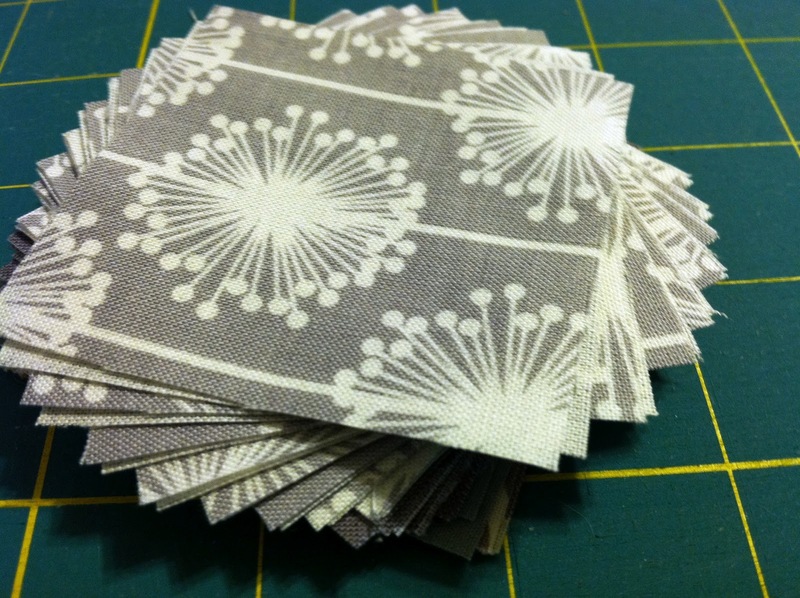 I just got my machine back on Sunday afternoon and spent the rest of the day hiding out with it in my sewing room. Before I got it back though, I ended up completing a bit of hand work for a wall hanging I've been working on for a while. I made these hexi's a while ago using a mini charm pack that I had won, unsure of what I was planning on making with them. 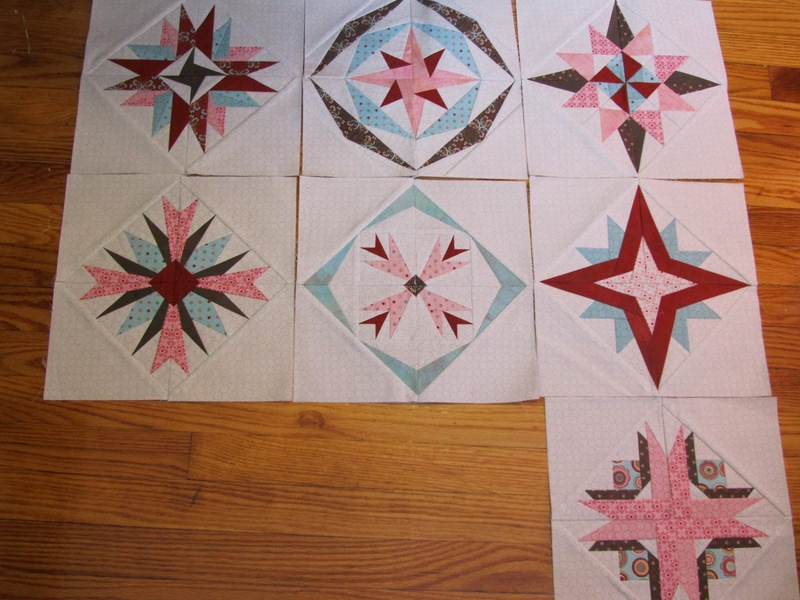 While I was machine-less, I finished piecing these together. 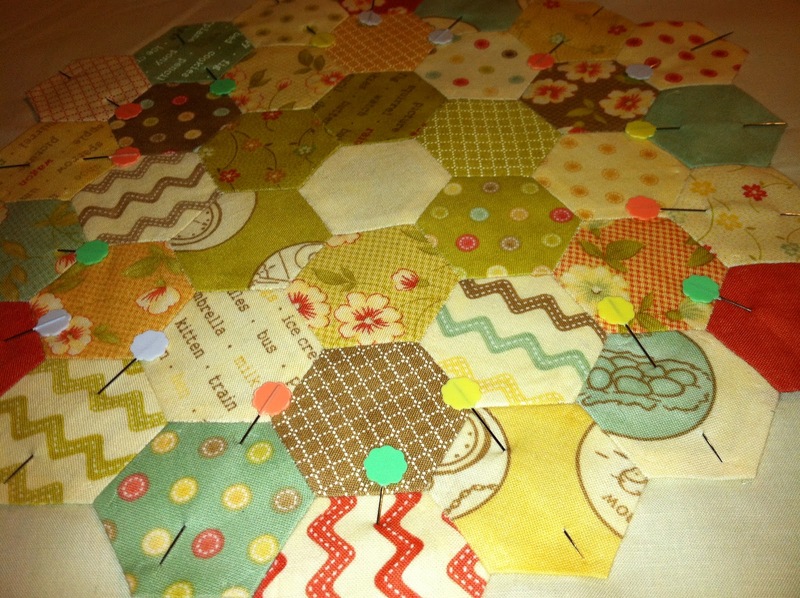 I'm going to sew it down onto a cream background, do some echo quilting around the hexi's and bind it in a nice brown kona. Here you can see that I have it all pinned down to the middle of the background, ready to be sewn onto the background and then quilted. As I noted a few days ago, I was traveling last week for work. While on the plane to and from, I spent some time reading a book, watching a movie on my iPad, and working on another tile block. 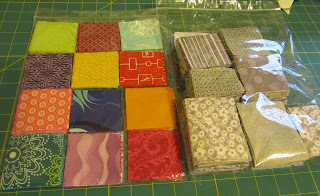 This is block three of the tile quilt blocks that I'm working on occasionally. I'm almost half done with this block. 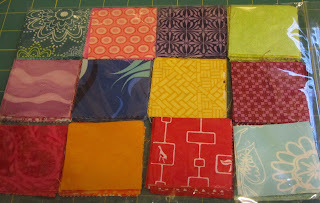 To me, this is a great block to take and work on while traveling because all you need is some thread, a needle and something to cut the thread with (dental floss cutter, nail clippers, etc.) and you can work on a block! 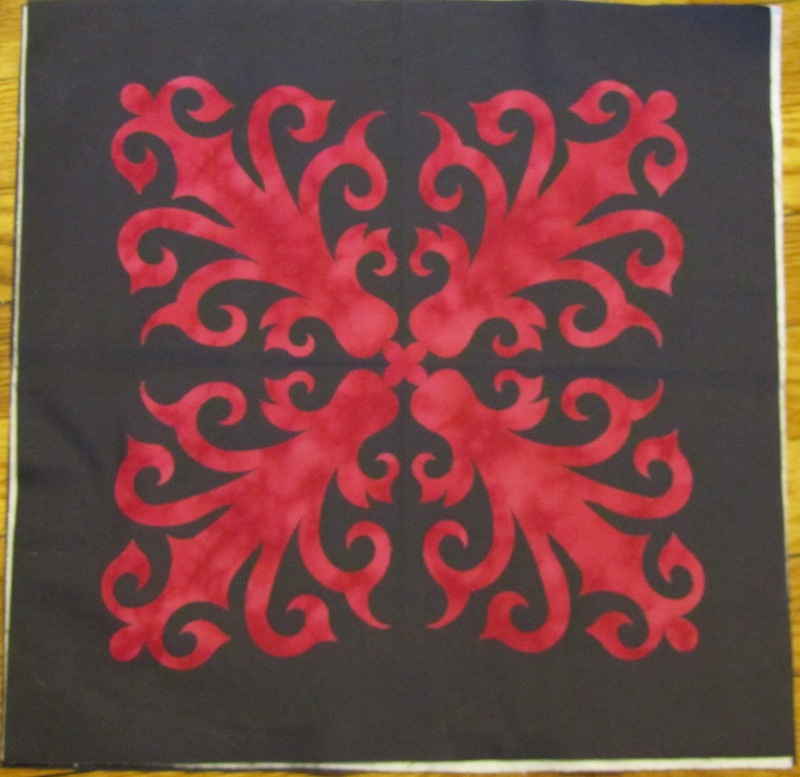 I prepared the block in advance and basted it at home before leaving, so I didn't even have to deal with pins. I have another trip coming up, so I'll hopefully finish this at that point. I love that even though I have no machine right now, I have a quilt that has been quilted and is ready for binding. Why is this? Because Natalia of Piece N Quilt custom machine quilted my frolic quilt that I made based on her Figgy Christmas quilt tutorial. Natalia has graciously allowed me to post the photos that she took and post them on my blog. I hope to take some photos myself once I receive the quilt back in the mail. 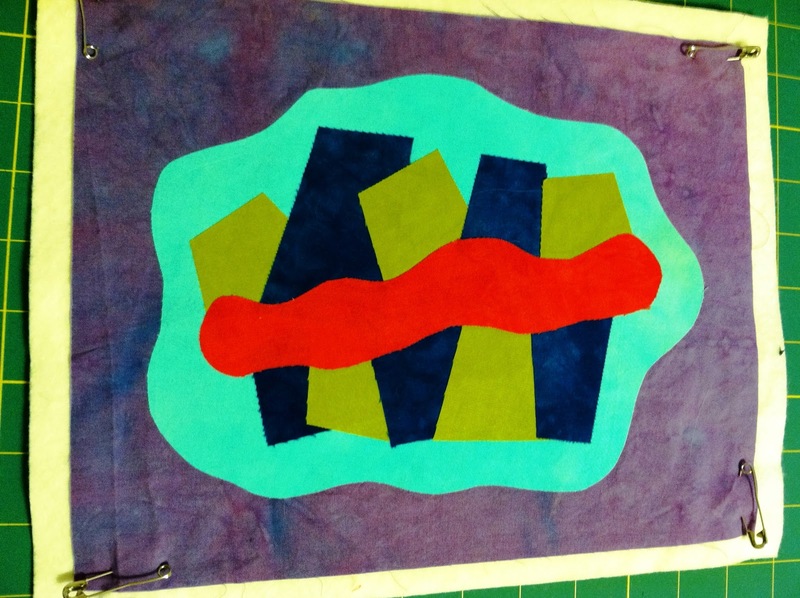 Here's a picture of the quilt after Natalia quilted it. Look familiar? 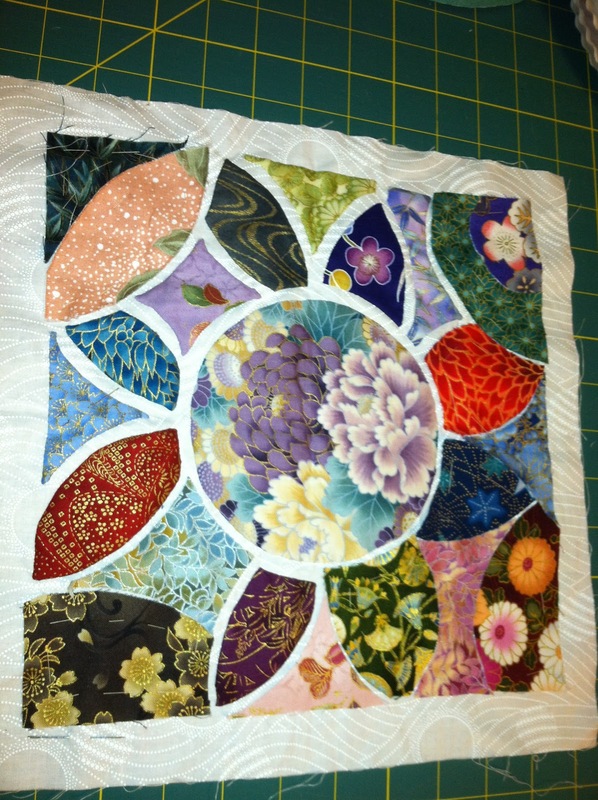 I asked Natalia to quilt flowers in each of the blocks. 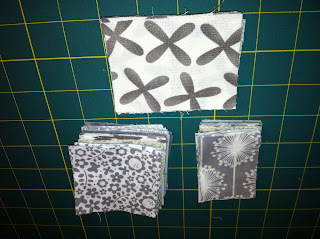 The fabric, Frolic by Sandy Gervais, has a lot of fun, funky flowers in it and these flowers play off of that. I especially love the three pebbles in each petal. How cute. 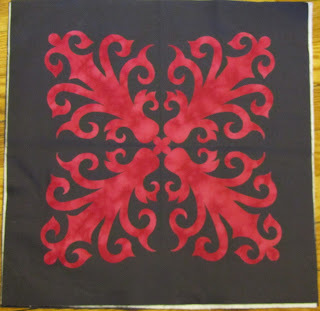 In the sashing I asked for a figure eight design ad I think it looks really great here. 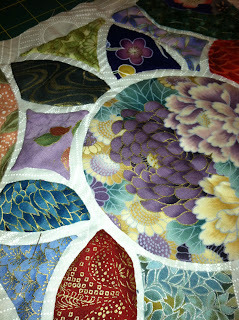 She also quilted tiny flowers in the 2" cornerstones. I'm not the best at applique. Actually, I can do a decent job if I want, I just don't have the patience for it. Natalia's pattern called for applique in this white section, bit instead I asked Natalia to quilt some similar flowers in different colored thread so that they'd pop. I like the way this came out. 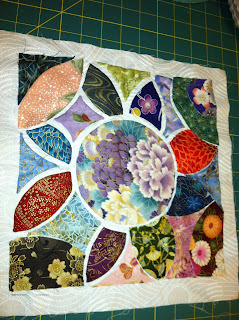 Finally, Natalia quilted more flowers, but this time with some stems in the upper most section. She quilted a bunch of pebbles around the flowers to make them pop. 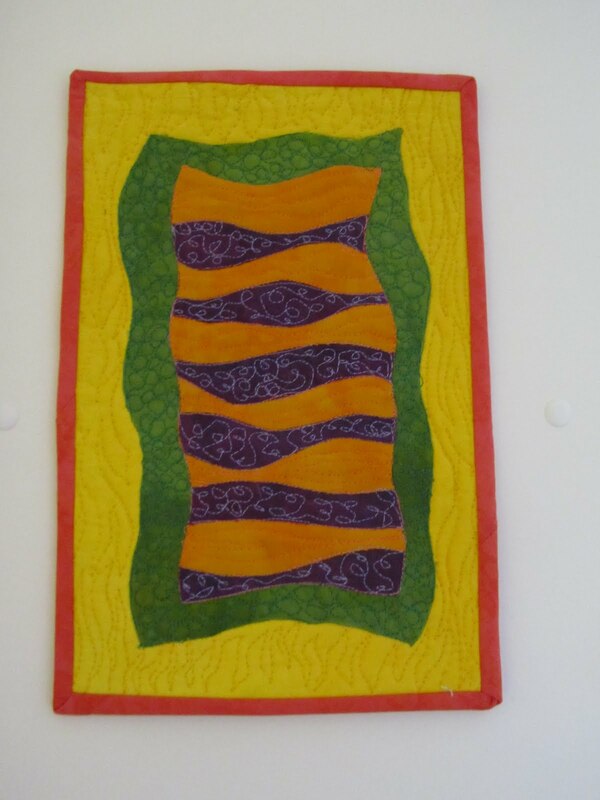 Now, I don't know how many of you remember my Figgy Pudding quilt that I made and quilted entirely using pebbles? Well, I swore off pebbles for a while after quilting that quilt. I remember I used up more than a dozen bobbins on that tiny 46" square quilt! Yikes. What I'm getting at is that I have total respect for Natalia for quilting all of those pebbles. I know it's easier on a long arm, but still. Thank you Natalia. I can't wait to see it in person. There's nothing like running your hands across a newly quilted quilt. Yup, the first thing I'm going to do is just rub my hands all of the quilt and admire the texture. 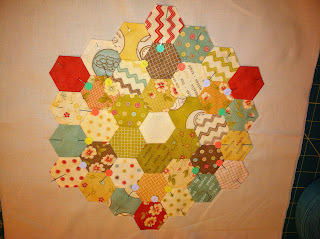 On The Modern Quilt Guild's blog, a tutorial was recently posted for an Octagonal Orb quilt block. 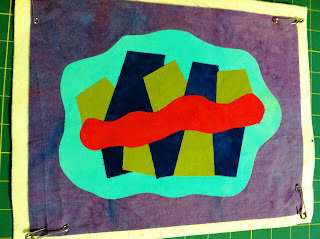 I decided that I wanted to make a quilt using this pattern. I like the color scheme of this block, but I thought it would be cool to alternate the color where the red is in the block above for each block I make. One block could be red, another green, another purple, etc. 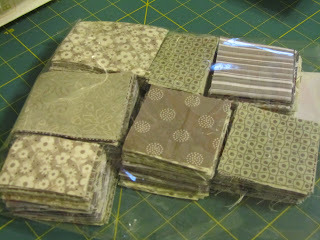 Last weekend I started going through my stash and began cutting my grey and white fabric into squares per the tutorial. 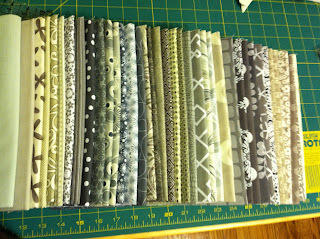 I realized I don't have very many grey/white fabrics, so I ordered some and plan to seek out some more as I visit fabric stores over the near future. 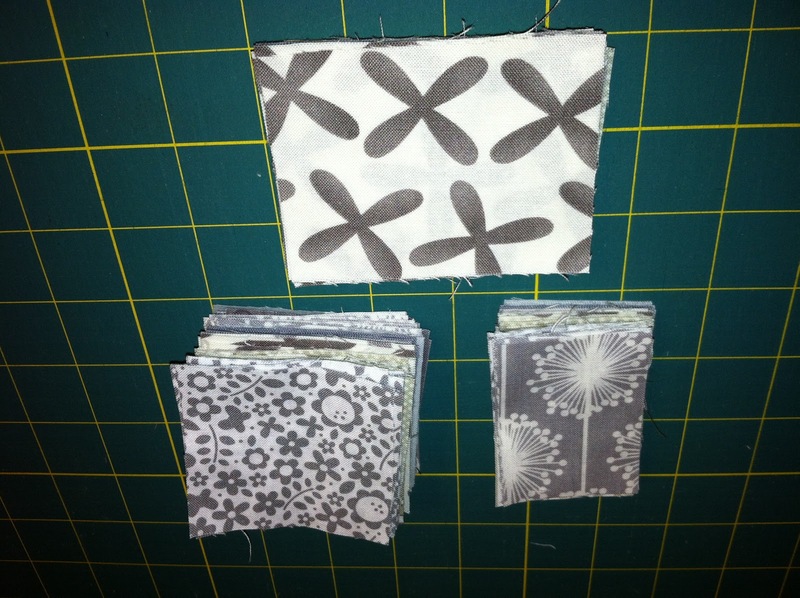 The biggest challenge is finding grey and white fabrics without black or other colors. I want the look of just grey and white with the accent color. This will probably be a longer-term project. 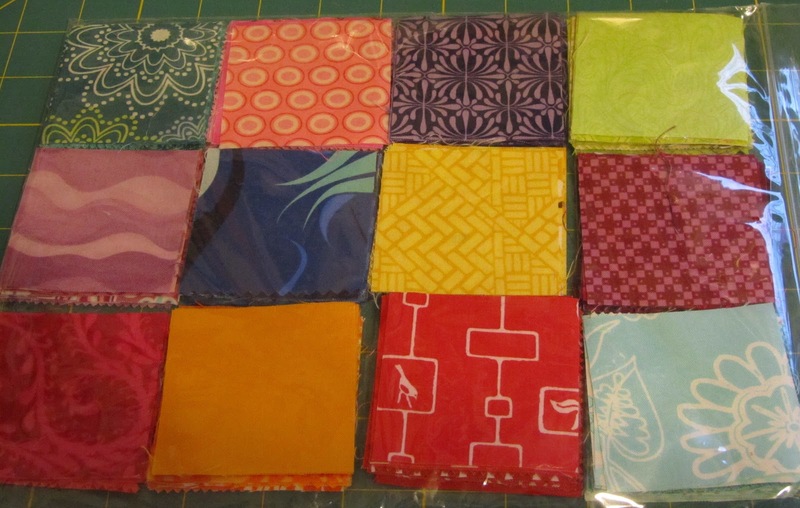 These half yard cuts just arrived last night. The color is off a bit since this photo was taken late at night and the lighting wasn't great. 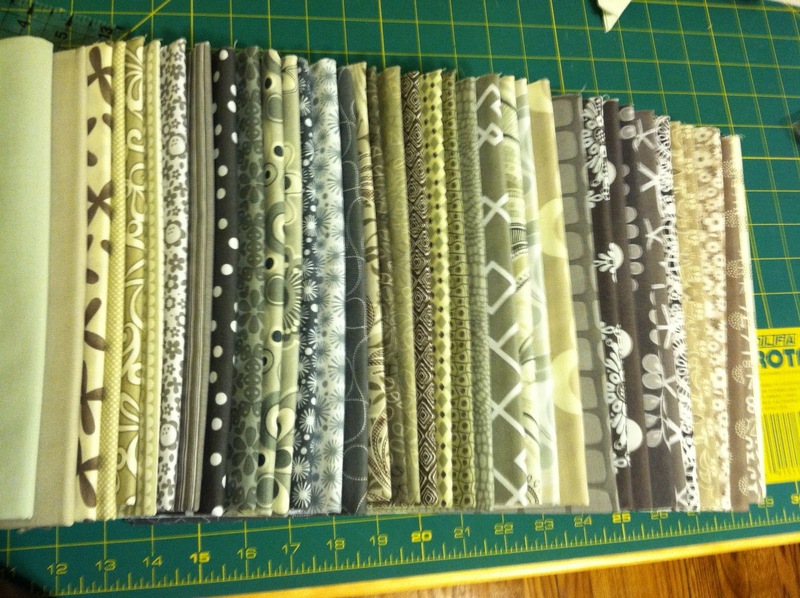 They're all grey grey and white fabrics. What did I do with them? I began cutting them all up! 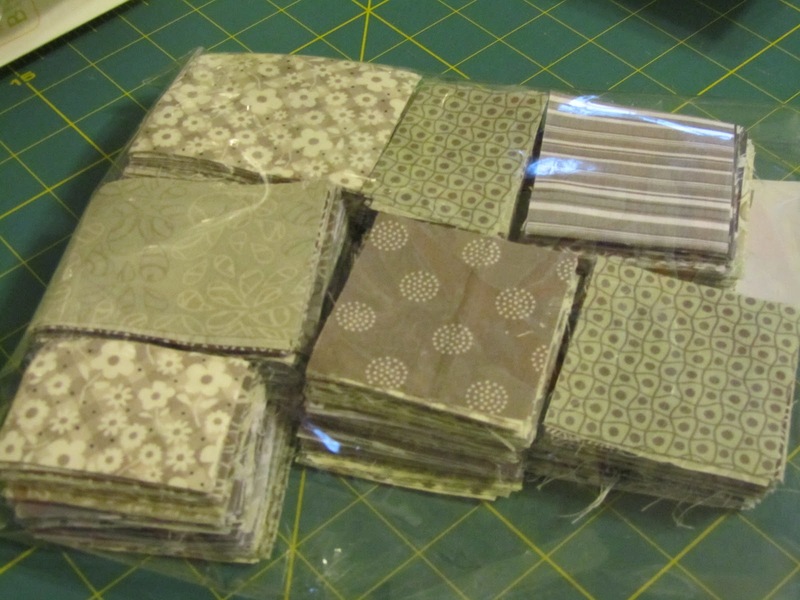 I still have a bunch left to cut, but hey, what else will I be doing without my sewing machine? 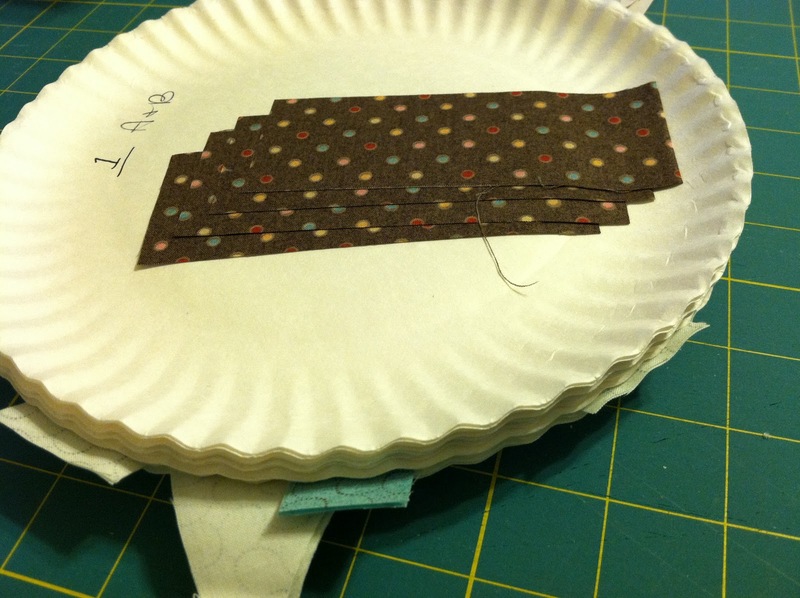 CUTTING!